“You want us to what? Did you say our groups are competing to make a Rube Goldberg machine? And we only have 20 minutes, a toy truck, a marble, rubber bands, balloons, dominos and wooden planks?” I recently heard an executive say this as we described the final project in an strategic planning training we were conducting for a Fortune 100 client. 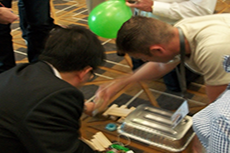 Why would we spend precious training time in these group activities with our clients? Why do we make them compete with each other? Because every time we wrap up serious training about strategy and implementation with activities that engage the teams and force them out of their comfort zone, we imprint the essential learnings. We had talked about the importance to communicating vision, the difference between leading and managing, they had all the theory. Now they had to put it into practice. What happens? Grown men and women become extraordinarily competitive. Sometimes the person who was stunningly quiet during the session becomes the leader, facilitating many approaches before landing on the idea that they will implement. Sometimes people tune out, and the group must find a way to re-engage them because part of the rules of the game are that everyone participates. Sometimes they try to find a way around the rules, they interpret the guidelines, sometimes they even cheat! But in the end, participants of learning sessions that actively engage them in participatory play retain the lessons. They are more likely to recall what they learned and to try similar tactics with their own teams. Engagement makes learning stick, it’s really just that simple. Try it!